Ben Foakes was largely in the team for his wicketkeeping. That, at least, was one of the arguments. 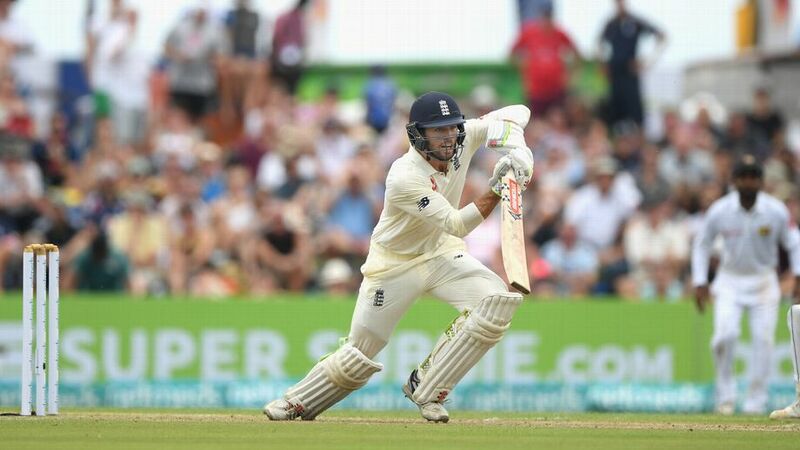 But following a morning session in which England’s more highly rated batsmen tangled themselves up in aggressive strokes and left the side at 103 for 5, it was debutant Foakes whose steady hand raised them gradually out of the ditch they had been in at lunch. Foakes used the crease, skipped out to meet the spinners, and he swept as well, but he did each of these in a much more measured fashion than the men who batted above him. Thanks to him, and the men who batted well in his company – Jos Buttler, Sam Curran and Adil Rashid – England can even claim to have grasped a position of strength in this match. A score of 321 for 8 at stumps on day one is not shabby, in a Galle Test. Foakes himself was not out, 13 runs short of what would be a plucky century in his first Test innings. Importantly, England also prevented Rangana Herath from imposing himself in the first innings of his final Test, and were also severe on the undisciplined Akila Dananjaya. Sri Lanka’s best bowler, by a distance, was offspinner Dilruwan Perera. Dogged and indomitable, he took 4 for 70 for the day, and in general looked like the kind of bowler who would do a manful job of leading the spin attack in the post-Herath era. Sri Lanka will worry, though, about the figures of Dananjaya in particular. He had had a catch dropped off him in the first session of the day, but went at 4.8 an over, finishing with figures of 1 for 96. In the second Test of this series and onward, he will be expected to bear a greater share of the bowling burden. Foakes added stands of 61, 88 and 54 with Buttler, Curran and Rashid respectively, but before he did much serious run-scoring himself, he had set himself up for a long innings the old-fashioned way: by batting watchfully in his first half-hour at the crease. Where the top-order men had been desperate to get on top of the spinners early, sweeping with abandon, and practically sprinting out of the crease, Foakes made sure his defence was in order first – it wasn’t until his 44th delivery that he ventured his first boundary. Just as a comparison, Joe Root had earlier struck five fours off his first 21 balls, before eventually running past a Herath delivery to give the spinner his 100th wicket at this venue. Buttler too seemed to think that more sedate progress was preferable to the adrenaline-fuelled efforts of the first session, and knuckled down to the business of working the ball into the gaps, like Foakes. It helped that the pitch, which had spent most of the previous two days under covers, seemed to have settled a bit after lunch. Buttler struck four fours in his 72-ball 38, before being undone by a canny change-up by Dilruwan, who rapped Buttler on the pad to raise a big lbw shout halfway through the afternoon session, before slipping in a skidding arm ball to take Buttler’s outside edge next delivery. The fact that Foakes was batting sagely and safely, though, seemed to instill a little calm in Curran as well. He too followed Foakes’ lead in playing himself gradually in. Curran did venture occasional big hits – particularly off Dananjaya, whom he enjoyed thumping down the ground. In between, he worked plenty of singles into the now wide-open outfield, though his defence was never quite as secure as that of Foakes. Eventually, one of his attempted wallops off Dananjaya brought his downfall, the outside edge flying to Dinesh Chandimal at slip. He was out for 46. Late in the day, Rashid thumped a few boundaries, racing to 35 off 38 balls, before himself being caught at slip, giving Dilruwan his fourth wicket. Rashid’s aggression did not inspire the same in Foakes, who could not be shaken out of his measured approach, even in the company of tailender Jack Leach, who batted through to the close.